Both prostate cancer and benign prostatic hyperplasia (BPH) can cause an enlarged prostate, but beyond causing common symptoms, the similarities end there. During your yearly physical, your doctor might do a rectal exam or request you get a blood test to check your prostate-specific antigen (PSA) level checked. 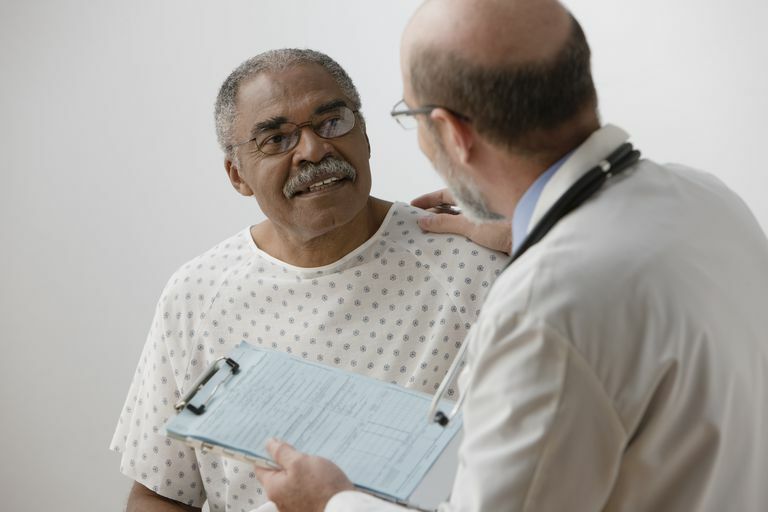 If your prostate is enlarged or your PSA test comes back high, your doctor may do a biopsy to determine if your abnormal results are caused by prostate cancer or BPH. Here's what you need to know about the two conditions and their similarities and differences. Prostate cancer is the most common cancer among men, typically affecting older men. Prostate cancer occurs due to uncontrolled growth of prostate cancer cell. Doctors aren't sure what exactly causes these cells to develop and grow, though. During the physical examination of your prostate, if you have prostate cancer, your doctor might notice that your prostate feels nodular or bumpy as well as firm and enlarged. Your blood tests will also show a higher PSA and alkaline phosphatase. Prostate cancer can affect any part of the prostate, but it is usually the lateral lobes, the sides of the prostate, that are affected. In advanced cases, prostate cancer can spread to the bones, but usually only travels to areas within the pelvis. Common early symptoms of prostate cancer include increased urinary frequency, hesitancy, dribbling, and frequent nighttime urination. How your prostate cancer is treated depends on how aggressive your cancer is as well as your overall health. Treatment can range from close monitoring to surgery, radiation therapy, hormonal therapy or a number of other less common options. Benign prostatic hyperplasia (BPH) is very common in men above the age of 40 and can cause the urinary tract to be obstructed. Unlike prostate cancer, BPH is not cancerous nor is it fatal. As you age, your testosterone levels increase, which, in turn, causes your prostate to grow in size or become enlarged. During a physical exam, if you have BPH, your doctor will notice your prostate feels larger than it should be. Your PSA tests will also come back elevated. Whereas in prostate cancer, the sides of the prostate are usually affected, in BPH the central portion of the prostate is usually affected. Also, unlike cancer, BPH cannot spread. The most common symptoms of BPH include urinary symptoms such as frequency of urination, hesitancy, dribbling, and frequent nighttime urination. Depending on the severity of your symptoms, treatment can range from nothing to medication to shrink the prostate, or surgery to remove the central part of the prostate to allow better flow of urine. While BPH does not cause prostate cancer, nor do researchers think it is a risk factor. it is possible as well as common to have both at the same time. Chang RT, Kirby R, ​Challacombe BJ. Is there a link between BPH and prostate cancer? Practitioner. 2012. Kumar: Robbins and Cotran: Pathologic Basis of Disease, 7th ed. 2005.